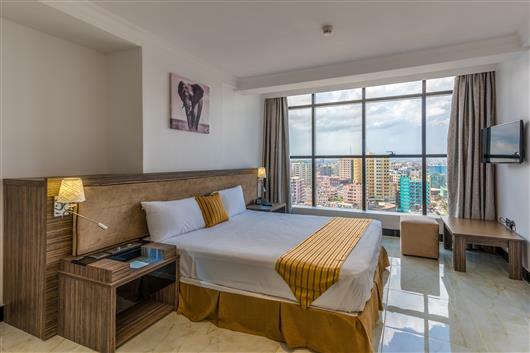 Golden Tulip City Centre : Located in the heart of the bustling city within walking distance of 5 minutes to Ferry port to Zanzibar, 15 minutes’ walk distance to nearby beach and just 14 km away from the airport. The Hotel is accommodated in 21 storey Tower occupying the top floors of this modern building with magnificent view of the sea, Harbor and city. The Hotel accommodates its guests in style within its various spacious areas, with not less than 55. 36 Superior Rooms: offer an optimum comfort with a complete range of services & amenities. They provide a space conducive both to work and relaxation, thanks to their design and the service we provide. 12 Deluxe Rooms: offer an optimum comfort with a complete range of services& amenities. They provide larger space conducive both to work and relaxation, thanks to their design and the service we provide.